We are living an unusual winter, cold and dry. However, a feature of the winter remains unchanged regardless of the wheather: light increases until joining the spring. In the Maresme autumn is defined by cold colours: silver, grayish blue and a hardly warm sun. Winter turns instead of warmer colors: Golden, morning and trasmontanos roses, and a Sun which warms up at noon. In Ca l’Antiga we cannot ignore these changes of light and colors and we want to make them protagonists of our plastic artistic activities. From the alabaster sculpture – form, light and transparency – that filled the gallery during the autumn now we turn to painting than captures, reflects light and plays with transparencies. In fact: Why light is so special? How does the painter capture it? What does see the viewer? Does the light disappear when we close our eyes? What happens with the painting’s light when the light goes out? Does it remain in our retina, in our memories? The exhibition Ca l’Antiga proposes is a journey through various paths, between light and darkness, transparencies, opacities, and special effects. A good program to help us make the transition from winter to spring with renewed luminosity. In April, Ca l’Antiga participates in Teià 2016 Cultural week, and therefore there will be literature at Ca l’Antiga. We present a little-known facet of Joan Vinyoli: translator. Vinyoli revealed during his life Friedrich Hölderlin and Rainer Maria Rilke, among other authors. Well known is the influence of Rilke on Vinyoli whose reflection, “poetry is not feelings, but experiences something” oriented him in his work. They are also known his translations of Rilke, but his relationship with the poetry of Hölderlin remains quite unknown. Vinyoli admired him and wrote about him – “other reality made just with hunches, wishes and longing from a world different from ours, that is what lives in Hölderlin poetry”. 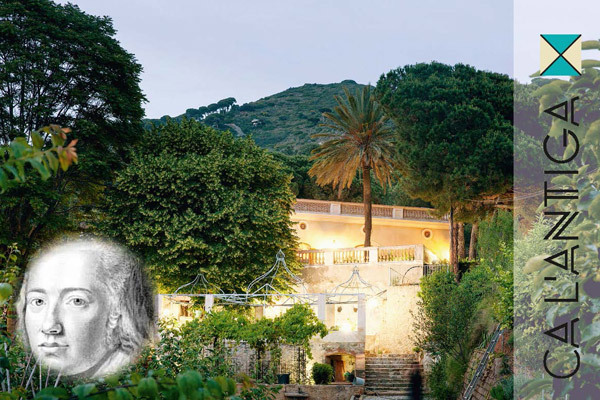 The literary meeting will allow us to know and enjoy poetry in different languages, from Vinyoli, Hölderlin and Rilke, arising directly from the hand of the poet and translator of poets. 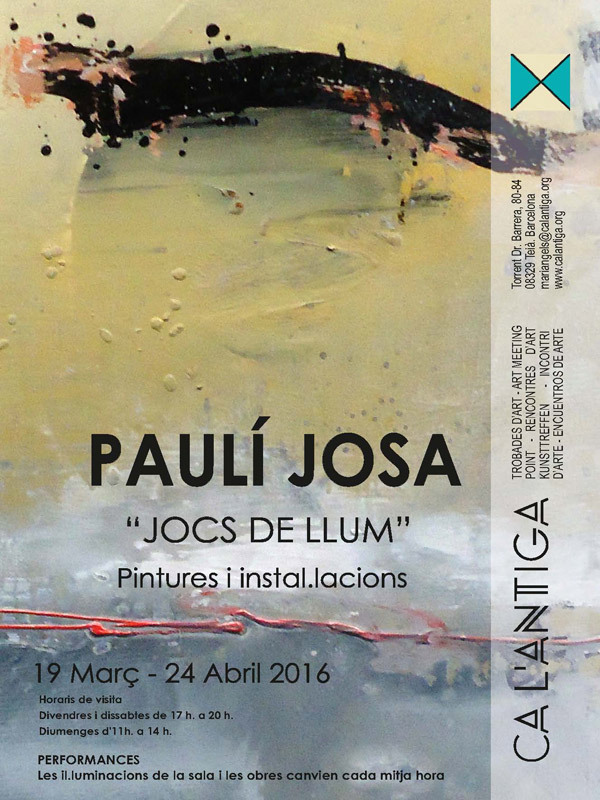 Pauli is a technical, innovative artist, also materialist and at the same time sensitive. He wants us to feel the painting, avoiding a single vision of the work, and to get it proposes parallel or divergent views. He fully plays with the light. Painting and reflecting, with transparency, with external light or darkness… Light inside/outside. Colours and opacities. Displaying with lighting and shadows. Discover one, two or three views of the same work. Light as a mirror, souvenir and metamorphosis. Reading of poems of Joan Vinyoli, Friedrich Hölderlin and Rainer Maria Rilke. Presentation of the book of Friedric Hölderlin poems collecting Vinyoli’s versions of 26 poems carried out in 1940 and 1941, discovered recently but never published until 2015. 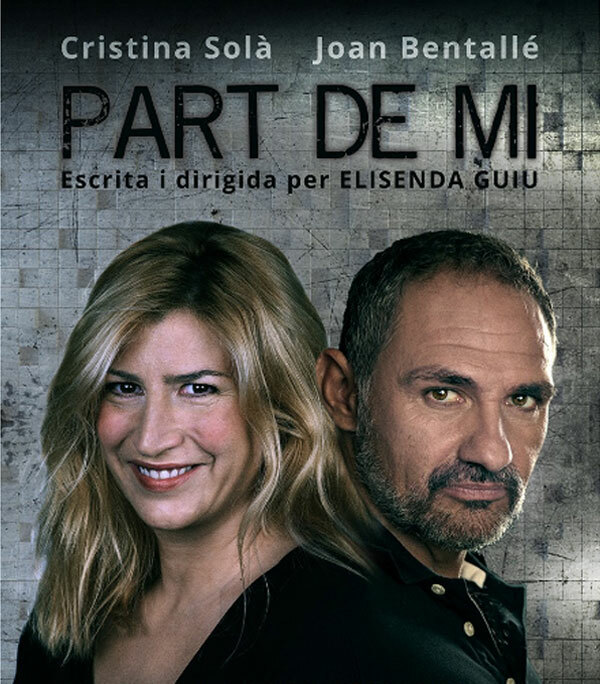 Come to Ca l’Antiga to enjoy the brief piece « Part de mi » written and directed by Elisenda Guiu with Cristina Solà and Joan Bentallé. Synopsis: What happen when somebody talks with his/her mind and doesn’t like the answer? After the performance the author and actors will shared with the assistance their opinion on the phenomenon of “Micro-theatre”. A glass of wine will be offered by Ca l’Antiga and the Celler Serra Sant Mateu of Teià. Reading of poems of Joan Vinyoli, Friedrich Hölderlin and Rainer Maria Rilke. Presentation of the book of Friedric Hölderlin poems by Vinyoli. Tobias Christ (co-editor) and Francesc Gelonch (poet). Written and directed by Elisenda Guiu with Cristina Solà and Joan Bentallé. During visiting hours, the lighting of the room and the works changes every half-hour.